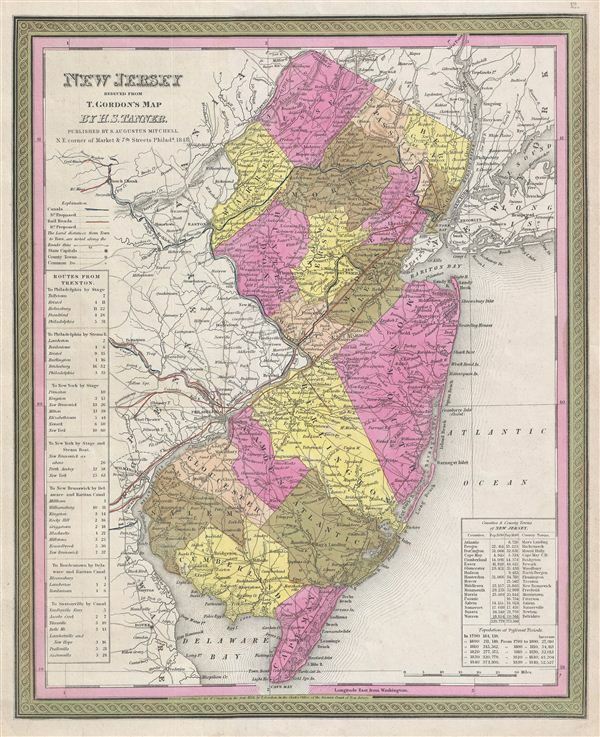 This is a beautifully detailed version of S. A. Mitchell's 1854 map of New Jersey. Extending vertically northward from Delaware Bay and Cape Bay, it depicts railroads, canals, rivers, State Parks, and bays to reach Pennsylvania on its left and New York on its right. It includes a list of the railroads serving the State on the left border, as well as an inset of a statistical table listing population in various towns, counties and periods on the lower left quadrant. The whole is engraved and colored in Mitchell's distinctive style with green border work and vivid pastels. Political and topographical features are noted and color coded with elevation rendered by hachure. Rumsey 0537.013 (1846 edition). Phillips (Atlases) 814.